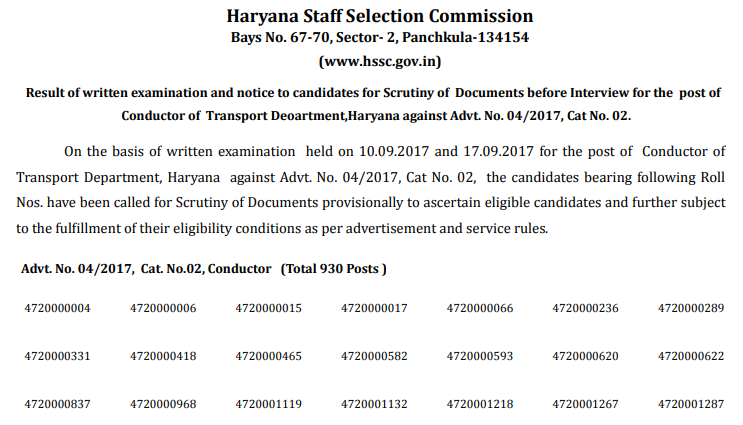 Haryana Staff Selection Commission conducted had conducted the written examination on 10th and 17th September 2017 for the 930 posts of Transport Department, Haryana. On 1st September, the commission has published the HSSC Conductor result 2018 of that written examination. A list of roll numbers of all the selected candidates has been issued by the commission. Shortlisted candidates have been called for the scrutiny of documents. Scrutiny of documents would be arranged from 15th September to 169th September. Selected candidates shall have to report at 9 AM in commission’s office bays No. 67-70, Sector- 2, Panchkula. The complete schedule for the document verification procedure would be notified very soon on Commission’s website. Candidates need to bring all the necessary documents, one ID proof, set of self attested copies of all documents and the copy of download application form. A candidate who won’t bear any of the required documents, the candidature of that particular candidate may be rejected. All the candidates should appear for the scrutiny of documents as no further opportunities will be given if a shortlisted candidate does not appear for scrutiny of documents. www.hssc.gov.in is the official web address where the selection list has been issued. On the home page, candidates need to follow the Result section available in the top menu. When the new page opens, links for all the latest results are available. Candidates have to press the PDF link against the Post section “Result of Written Examination and notice to the candidate for Scrutiny of Documents before interviewing for the Post of Conductor”. The PDF file consists of roll numbers of candidates shortlisted for the scrutiny of documents. 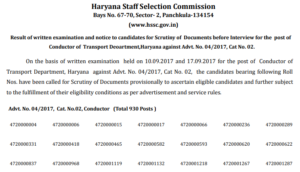 The recruitment notification was published by the Haryana Staff Selection Commission on 18th May 2017 for a total of 930 posts of conductor and 2038 posts of Heavy Vehicle Driver. As per the notification, candidates who had completed their matriculation or equivalent from a recognised board, have knowledge of Hindi/ Sanskrit up to Matric standard or higher education and possess conductor license was recorded as eligible candidates. To Get Latest Result Updates, Stay Tuned With ALL INDIA ROUNDUP.